Bess beetle (Passalidae) on decaying wood. My labmate Paul brought me a box of bess beetles (family Passalidae) left over from a live insect lab. I love these little squeakers, so I was pretty pleased. I am not the only one who thinks the beetles are adorable. BugGuide attributes the common name “bess beetle” to the French word baiser, “to kiss,” apparently due to the squeaky “kiss” noise these beetles make when disturbed. This stridulation is produced by rubbing the top of the abdomen against the hind wings. In fact, bess beetles produce at least fourteen distinct acoustic signals (Schuster 1983), giving them a pretty complex repertoire for an insect. Less cute story: when I was a kid, my brothers and I caught one of these for somebody’s science class. We put it in a jar with some acetone and had to take it out again because it sounded like it was screaming. (Anybody seen the Fly?) Now that I’ve shared that adorable story, let me go back to talking about my awesome new pets. 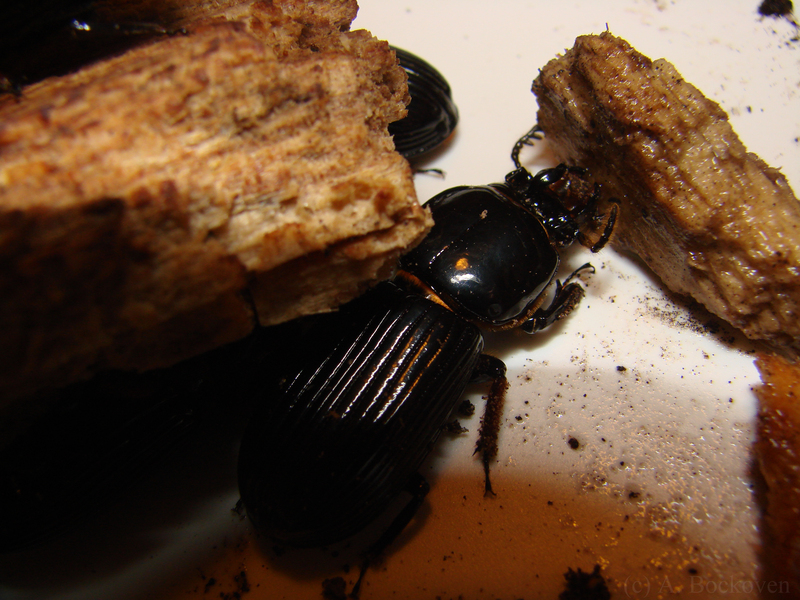 Bess beetle chewing dead wood. Bess beetles employ a fairly elaborate vocabulary because these beetles are subsocial. 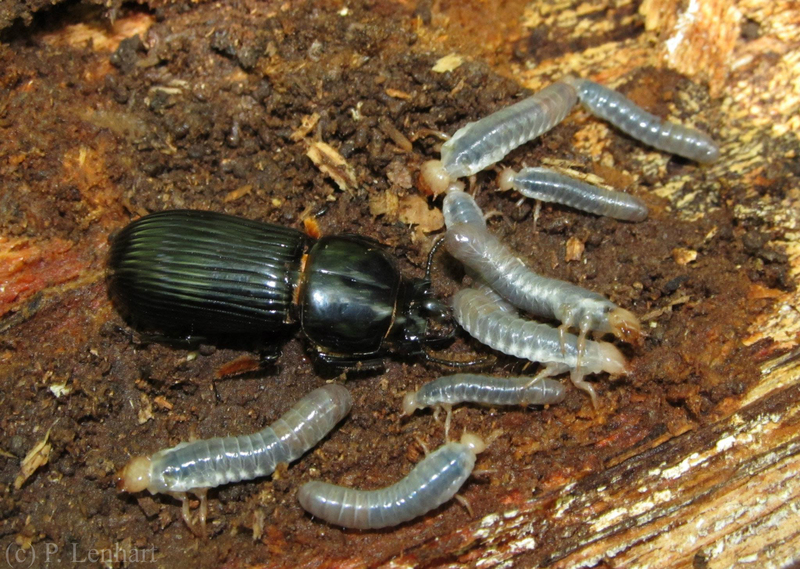 Adults excavate galleries in the dark recesses of rotting wood where they live together in family groups, cooperatively caring for their brood. Larvae are fed pre-chewed wood by the adults. There’s an extra twist. 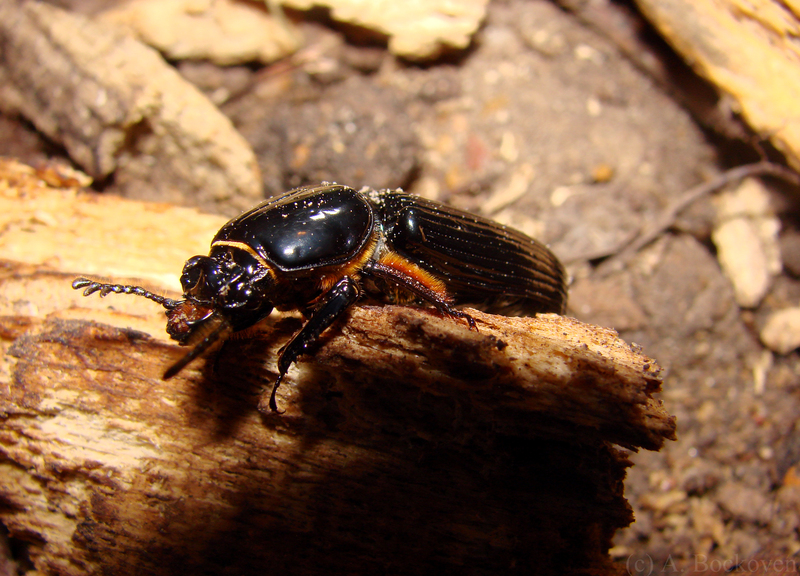 Unlike termites, bess beetles don’t have endosymbionts in their guts to digest wood for them. Instead, they process the wood and excrete it, wait for microflora to further digest the wood, and then eat it again. (Rabbits, as ruminants, employ a similar “eat it twice” tactic. If I have destroyed your image of bunnies, I apologize.) Both adults and larvae starve if they are not allowed feces as part of their diet. Yum yum!